You DO NOT NEED TO ENTER A PROMO CODE when joining AlphaDraft if using our bonus links – you will receive a first time deposit bonus up to $1000 FREE! 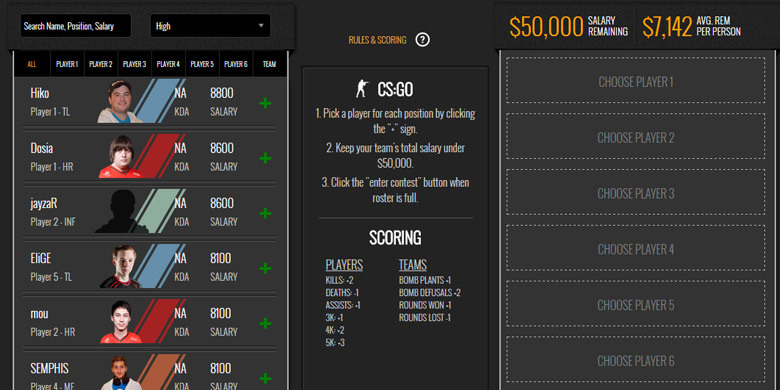 Clicking any of our AlphaDraft links activates the bonus when making your first deposit. AlphaDraft.com has come out of the gates with solid funding and a great website that has propelled them to the top of the Daily Fantasy Esports industry. They have partnered with some of the best Esport Gamers and Teams looking to make themselves front and center in this new growing industry. We see only big things from this company in the near future and with some additional rounds of funding, they should make the Esports news headlines by offering some of the biggest prize pools. Entry fees vary for every contest and can be as small as 1 cent all the way up to $500. In addition to paid games, they also provide freerolls for players – in fact, AlphaDraft is one of the better Esports sites for freerolls. They always have a nice selection of free games to play for real money; it’s a great feature for new players looking to practice and develop skills before jumping into higher level contests. All contest titles are clickable, which will open up a popup window with more details about the fantasy contest. Overall, Alpha Draft has a solid selection fantasy contests and prize pools, but we hope to see them grow even bigger in the future. AD uses a slick dark design for their lobby and we must say it works really well. The very top of the lobby holds all the important menu features like account functions, current contests and latest fantasy news from their blog. Right below the menu is a featured section where AlphaDraft will have select tournaments or important information for their users. Right above the contest selection screen is a neat little tutorial button that will take you to a quick tutorial of the site and how to draft – it’s a simple feature for new players that most sites should have…but don’t. As for the contest selection screen itself, it is very easy to read and use, which is a big plus. They have a nice filter system to the left which allows you to filter contests by game, contest types and leagues. Featured contests, like tournaments or freerolls, are denoted by a different colored hue which makes them easy to identify from the rest of the pack. They also have a live chat function that can be opened or closed, which is a good option to give users as sometimes chat boxes can be really annoying to look at if they are constantly open. Overall, AlphaDraft has one of the best lobbies in esports and there is not to much to complain about. AlphaDraft.com has an easy and well designed draft screen and provides the best data we’ve seen from an Esports site yet. 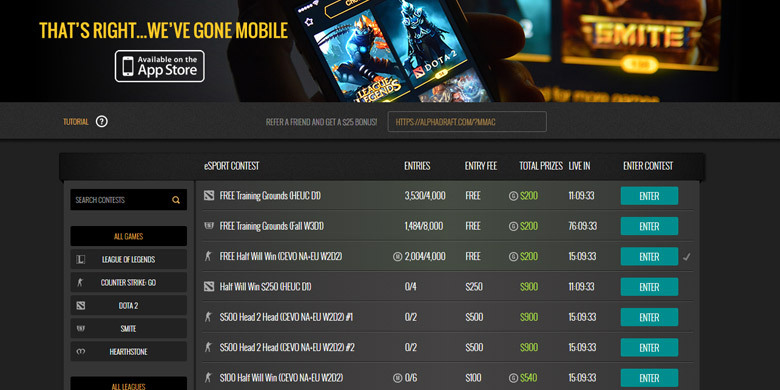 All details about the contest are located right at the top which includes prize pool, payouts, entries and game match-ups. The player selection screen is on the left and you can filter players by position or search for a specific player in the search bar. Where AlphaDraft stands out is the stats they provide for each player. By hovering over a player you get a wealth of stats to help you determine whether they are draft worthy or not. You can see average team season stats across all scoring categories, average season player stats, last game points, season totals and last weeks salary. This is great information especially for new players and gives them an edge on competition in this aspect. They also provide a live Twitch feed of current online streaming Esports games going on. This adds so much more fun to playing Fantasy Esports as you can follow along with all the action and watch your drafted players earn points live. The minimum deposit is $10 and the max is $1000. Their deposit method screen is very simple to use and you can use one of their pre-selected amounts or make your own custom deposit. 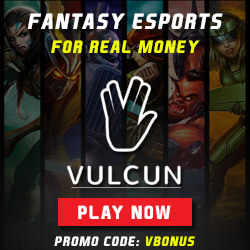 Don’t forget if you click through any of our AlphaDraft links, you will receive a 100% bonus up to $1000 on your first deposit. The minimum withdrawal is $10. Hopefully one day, these states will loosen up and allow players from these regions to enjoy Fantasy Esports like the rest of us. We rate AlphaDraft a great 4 out of 5 site. 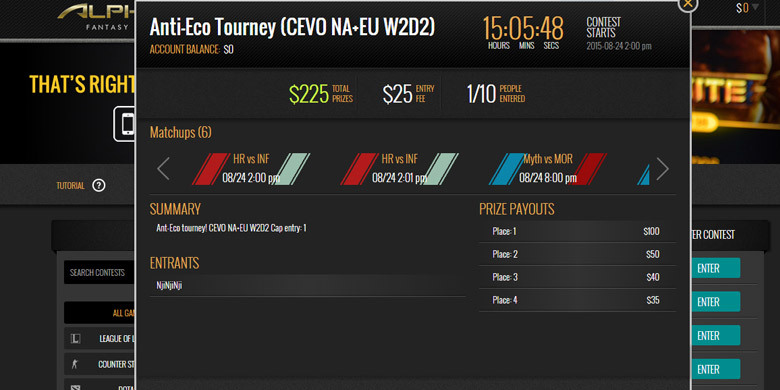 They are a very solid esports site and the only ones in the industry offering contests for real money. We love the look of the site and the easy navigation and filters. There’s no question you should create an account at AlphaDraft and we hope to see some additional funding in the future which will allow them to increase their prize pools and help keep them at the top of the fantasy esports world.